As you might remember, a gluten-free diet wasn't always so well known. Those who had to follow its rules were often met with confused stares or polite shrugs as they described the celiac disease, and then they were usually faced with one of two options. The first was to eat something that wouldn't have traces of gluten in it—maybe. The second was to go ahead and eat a meal with gluten in it, hoping to work through the stomach pains later. Neither one is that appealing if all you want is pasta, pastries, or a sandwich. Oh, how times have changed. In the last few years, a gluten-free diet is not only widely understood, but it's also readily accessible. Take these 10 gluten-free recipes, for instance. From baked carrot cake donuts and a chicken salad sandwich to braised short ribs and golden pancakes, it's never been easier to eat gluten-free from morning until night. Read on to see why these gluten-free recipes should make it into your kitchen—even if this diet isn't necessarily for your health—because of their flavorful combinations, fresh ingredients, and relative ease. Soon you might not remember cooking without them. What Makes It Gluten-Free: Taylor Kiser at Food Faith Fitness understand that most people have even the slightest sweet tooth for donuts, and that's why this gluten-free option—which is made with almond meal, coconut oil, coconut flour, egg, cinnamon, nutmeg, and grated carrots—is so appealing. It still has the sweetness, warmth, and comfort of a traditional donut, but won't upset stomachs. 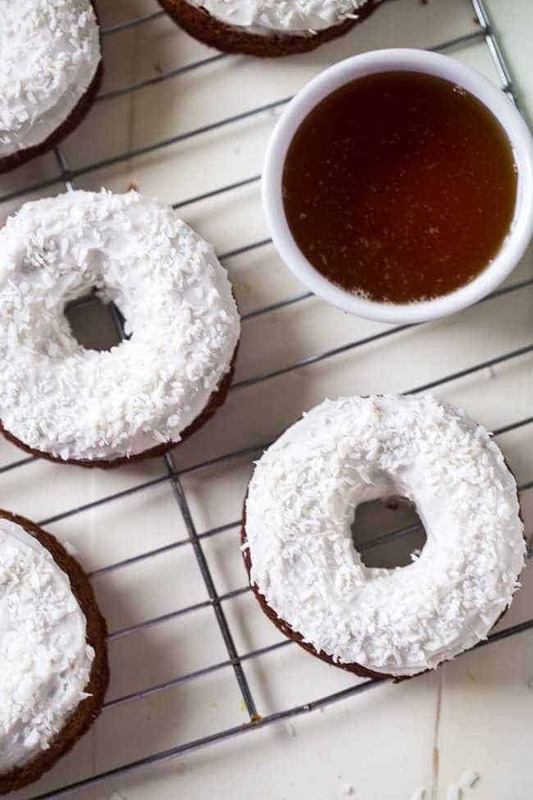 Why We Love It: Kiser chills a can of full-fat coconut milk overnight as part of the frosting, and then tops it off with crunchy coconut flakes. It provides more sweetness to the donuts, but some necessary texture, too. What Makes It Gluten-Free: To make this heaping bowl of pasta, Taylor Kiser of Food Faith Fitness mixes gluten-free spaghetti noodles in a salad with pine nuts, minced garlic, halved cherry tomatoes, and sliced basil, making for a meal that's light and flavorful. Everything is tossed together in a vinaigrette of lemon and olive oil, too. Why We Love It: This recipe is all about fresh ingredients, and that's especially true of the artichokes that are roasted before the pasta cooks. These vegetables are cooked with peeled garlic and olive oil, which adds color and flavor to the finished dish. What Makes It Gluten-Free: It's all about the bread Taylor Kiser from Food Faith Fitness chooses for this layered sandwich, and in this case, it's millet-chia bread. Two slices bookmark minced red onion, roasted almonds, chopped goji berries, avocado slices, and Dijon mustard, making for a lunch that you're bound to look forward to all morning. Why We Love It: It takes little time and effort to recreate this sandwich, but its array of superfoods will ensure that you feel satisfied—and stay full—until dinner. Apple slices also give this sandwich a crunch, in case you're missing that satisfying sound from potato chips. What Makes It Gluten-Free: Tieghan Gerard at Half Baked Harvest has created a taco salad so good, you'll put it on regular rotation. Thanks to the chipotle-seasoned turkey taco meat, mixed leafy greens, black beans, sliced avocado, and died mango, one bowl has enough flavors and textures to keep you eating until the very last scrap. Why We Love It: If the salad isn't enough to pique your interest, then maybe the dressing will be. Gerard mixes together Greek yogurt, lime juice, honey, apple cider vinegar, and jalapeño together for a topping that's tangy and acidic, which perfectly complements the spices in the salad. What Makes It Gluten-Free: Don't let the time commitment on this recipe from Tieghan Gerard at Half Baked Harvest intimidate you—the effort is entirely worth it. Five pounds of bone-in beef short ribs are cooked slowly in a mixture of onions, shallots, carrots, dry red wine, fresh thyme, and fresh rosemary. When the cooking is through, the ribs are placed atop warm mashed potatoes. Why We Love It: The slow cooker does most of the work on this recipe, and the only thing to really remember is to add fresh cranberries two hours before the cooking is through. Not only will the cranberries add a deep red hue to the plate, but they'll incorporate a sweetness into the meat, too. What Makes It Gluten-Free: The last example of gluten-free cooking from Tieghan Gerard at Half Baked Harvest is also a showstopper because of its enveloping flavors and bright presentation. Gerard seasons and sears bone-in pork chops, then add butter, garlic, apples, and sage to the hot skillet. Everything is finished off with thyme. Why We Love It: This is essentially a one-skillet meal that has the look of heavy lifting. As long as you keep your skillet hot—and you have apple butter on hand— then this is an easy recipe to pull off for guests or even alone on a weeknight. What Makes It Gluten-Free: Alyssa Siers at The Modern Proper created this dish as a breakfast feast, and it has all the makings of a good one. Peeled sweet potatoes, sliced bell peppers, sliced onion, and carnitas sizzle together in a skillet, and then all that flavor is topped off with a fried egg, avocado, and cilantro. Why We Love It: It may take some time to get the carnitas just right, but it's worth it. They add a spicy richness to the vegetables and make it easier to scoop up every last bit of egg. What Makes It Gluten-Free: Natalie Mortimer at The Modern Proper roasts cauliflower florets in taco seasoning, olive oil, and lime juice, and then tops it with an avocado crema made with minced garlic, sour cream, and cilantro. Layer it all in corn or gluten-free tortillas, and top it off with shredded cabbage and more cilantro. Why We Love It: Follow this recipe's every detail, and you're sure to bite into a hearty and flavorful taco with plenty of color and seasonings. But we also love that this recipe lends itself well to more additions—from the easy spoonful of salsa to the more involved roasted corn. What Makes It Gluten-Free: Dana Shultz at The Minimalist Baker whips up this banana bread using almond meal, gluten-free oats, brown sugar, coconut oil, and spices alongside the namesake fruit to create a loaf that's hearty and sweet. Best of all, everything can be mixed together in one bowl. Why We Love It: There are only three main aspects of this recipe, which mostly revolve around mashing the bananas, mixing in the ingredients, and baking it. The toughest part of it all is waiting for the bread to cool before you can slather a slice in butter and honey—as Shultz suggests. What Makes It Gluten-Free: Even if pancakes aren't a staple of an everyday diet, it's still enjoyable to dig into a stack on a special weekend morning, and this recipe from Dana Shultz at The Minimalist Baker ensures that everyone can participate in this simple pleasure. Her pancakes are made with brown and white rice flour, yellow cornmeal, oat flour, and baking powder for the pancake mix, and then an egg, butter, and buttermilk create the batter. Why We Love It: Once you have the batter ready, this recipe turns into golden brown pancakes in a few minutes. Serve it with honey, butter, and syrup, and it becomes the perfect slow morning treat. Up Next: Without a Doubt, These Are the Best Cookbooks to Upgrade Your Gluten-Free Meals.